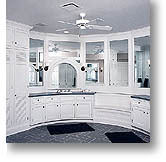 P & T Millwork, manufacturers of custom cabinets for kitchen and bath, bookcases, entertainment centers. P & T Millwork produces custom kitchens, baths, bookcases and entertainment centers. Our computerized cabinet making system starts with solid modeling design. Whether following an architect's plan or matching a picture from a magazine, we will design your cabinets the way you want them. Cabinets may be face framed or frameless. You don't need to work with standard sizes and fillers. There are no standard cabinets in our warehouse because what we build is made for you. From the design phase, we produce scaled CAD drawings of floor plans, elevations, and sections. The drawings may be submitted to architects or clients for approval. Three dimensional room drawings are also available. Our manufacturing process starts with computerized cutting and milling of cabinet parts for the utmost in accuracy. Craftsmen dedicated to the finest quality standards perform cabinet assembly. 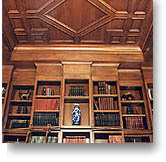 Their talent is invaluable when working with special features such as beaded arches, fluted columns, or curved cabinets. Custom finishes are available.